So far this week I've eaten at Quizno's, Sonic and Cracker Barrel. And it's just Tuesday. Yeah, so much for any notion of a New Year's resolution to at least try to eat better. 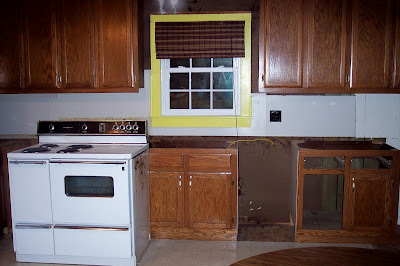 As you can see in the shot above, my kitchen is in disarray. Oh, but it's such a happy disarray. Little background: We live in a charming old house that used to belong to Greg's great-grandparents. While there are many characteristics that I love (like the arched doorways and built-in bookshelf in the living room, higher ceilings), there has been plenty of room for improvement (for instance, tile where there was once carpet in the bathroom, drywall in two bedrooms and the hallway, off-white paint instead of aged mint green in the attic). But the project I have been planning in my dreams is the kitchen. Greg found a good deal on some gently used (and I emphasize gently used) oak cabinets. We're talking a third or fourth of what brand new, wood cabinets would cost. We considered it a sign to get moving on the kitchen renovation. Well, an almost total renovation. We're holding off on the floor because that's a pricey project. But maybe now that we've started that will come sooner than later. Anyway, "they" started Monday. Since then, the old, canary yellow cabinets have been removed and are sitting in our garage. (Canary yellow is MUCH better than the forest green that was on them when we moved in. I suppose, I'm a bright kind of person. But for some reference, see the window frame that is yellow because it also was once green ... Don't worry, it's not staying yellow either.) Some of the taller, prettier cabinets have since been hung. I've picked out counter top, back splash, a sink and faucet, dishwasher and range. Yes, I said dishwasher. As I type, there are baby bottles soaking in the bathroom sink. That's how I've always washed them. In fact, for the past 4 1/2 years, the sink has been where I've washed all our cups, plates, bowls, silverware ... although usually it's the kitchen sink. Our stove was extra wide with much wasted space (maybe you can tell in the picture, as it can't fit in the hole designated for our new range), so we used the renovation as an excuse to scale that down. Cate isn't sure what to think of sounds of men working in our house, but I love them. Old houses are indeed works in progress. That's why I'm doing my best to hold out for the tile that will one day replace the white vinyl flooring in the kitchen and the carpet in the living room that is really like an extension of the kitchen.